Karl, Bill and Patty Rabe (l-r) at home with their dog Sherlock. Bill Rabe will be moving to a condominium in Saline that was designed for the developmentally disabled. It's part of a new neighborhood open to all. Saline’s in Southeast Michigan, just outside Ann Arbor. Patty and Karl Rabe live in a quiet subdivision there. Patty, 61, is a nurse anesthetist. Karl, 58, is an information technology manager. Their son Bill is 28. He’s friendly and social, but his mom says he functions at about the level someone who's between six and 10 years old. Bill was born healthy, but developed more slowly than other kids. His disability doesn't have a firm diagnosis, but he has severe problems with speech and vocabulary. 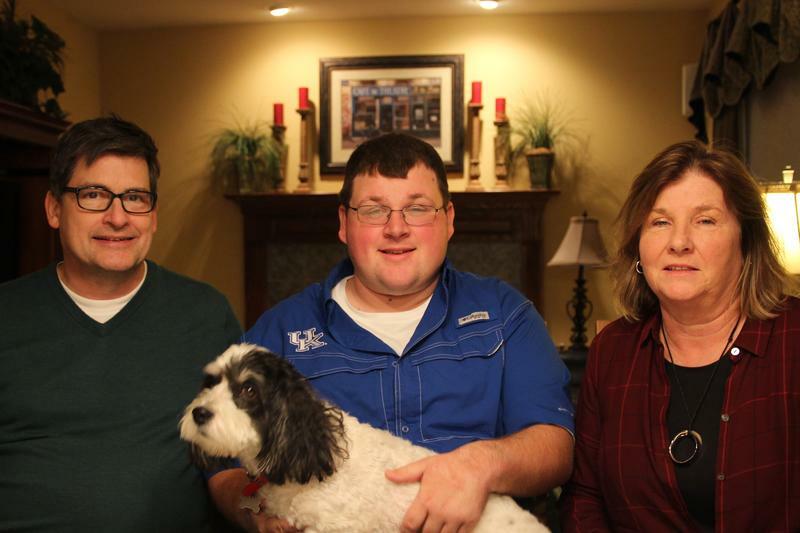 Still, Bill holds down two part-time jobs, is a Special Olympian, and likes to watch movies and play video games. His favorites are hockey games. For years, the Rabes searched for a long-term housing solution for their son. Patty says he can do some things himself, but needs to have someone around. “When it comes to any kind of emergency or unusual situation, he couldn’t be trusted to make good decisions about what to do,” she said. The Rabes found other local families in a similar situation. Eventually they began planning a building with four condominiums for their children with a common area for a paid caregiver. Then they met developer Bill Godfrey, who started thinking a little bigger. “We came back with this idea that what was really needed was just to build a regular neighborhood for the general public and include housing for people with special needs in it and design that housing with them,” Godfrey said. Godfrey’s team bought land from the city of Saline with enough room for two condo buildings for people with disabilities and 26 single-family homes and townhouses anyone can buy. Planned communities for the disabled aren’t a new idea, but they are unusual. New research by the ARC found that less than 2 percent of all adults with intellectual and developmental disabilities live in a planned community. 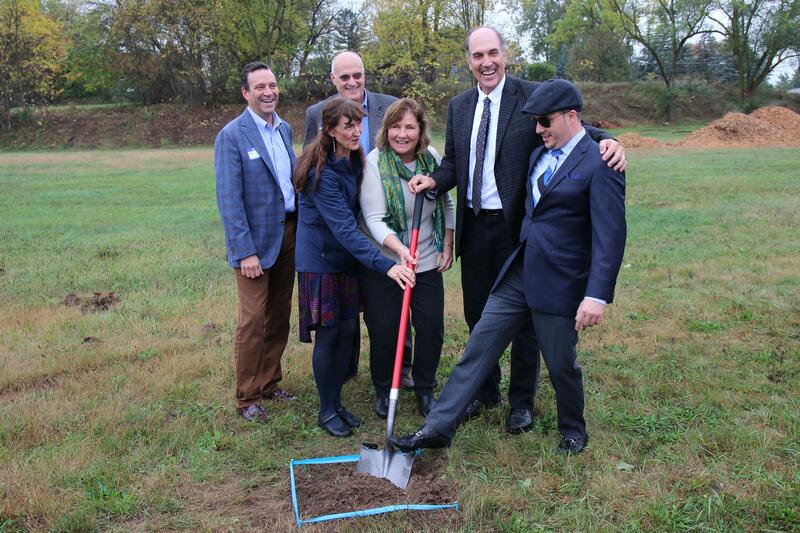 Jackie Macy, Patty Rabe, developer Bill Godfrey and Saline Mayor Brian Marl (front row l-r) at the groundbreaking for Maple Oaks in October 2017. 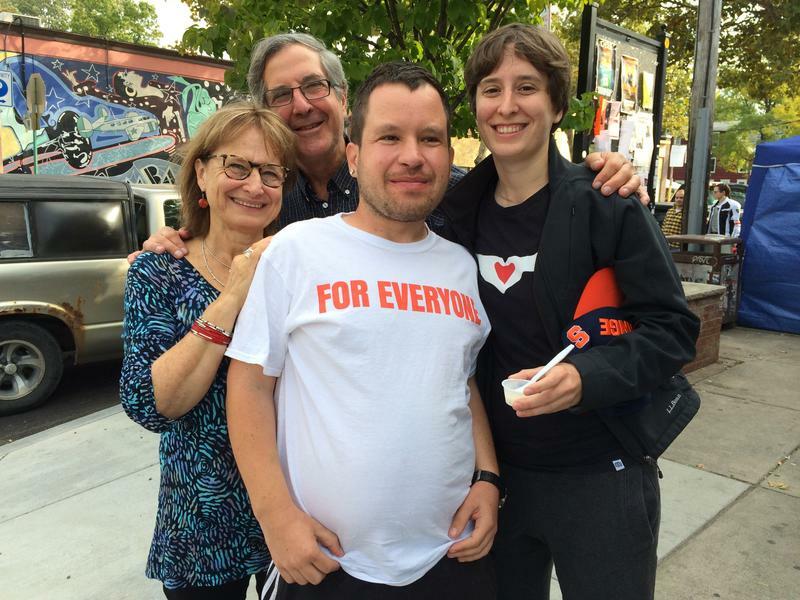 Macy and Rabe spent years working to find an independent housing option for their sons, who are friends and have developmental disabilities. The Saline development is called Maple Oaks. The ceremonial groundbreaking was in October. The site plan shows a tree-lined cul-de-sac. The public library and middle school are across the street. The condos started at $180,000, houses at $250,000. Those are attractive prices in a tight market and most have already sold. The Rabes bought a house to be near their son's condo. Patty's feels good about her future neighbors. While most advocates agree that integrating people with disabilities into society is crucial, there’s debate over how best to do that. Dohn Hoyle thinks the Saline project falls short. Hoyle is the public policy director for the ARC Michigan. Because the condos will have 24-hour care and house only residents with disabilities, Hoyle sees less independence than what’s being marketed. “It will be their own place in the sense of their own condo, but remember what you’ve done is you’ve set up a group-living situation [by] having everybody who lives there have a disability,” Hoyle said. Desiree Kameka disagrees. She’s with the Madison House Autism Foundation, which is based in Maryland. Kameka says unlike group homes, the families will own the condos, giving them more control. Most of the young adults qualify for some government funded in-home care. The families are hoping to pool some of those resources. 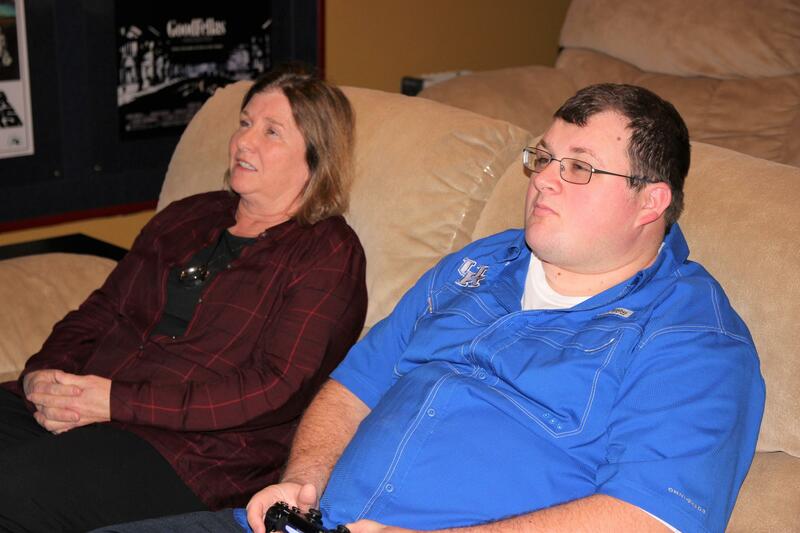 Patty Rabe looks on as her son plays a hockey video game at their current home in Saline. Bill has difficulty with speech and vocabulary, but enjoys technology. Now, after years of planning, the Rabes are looking forward to moving into Maple Oaks later this year, but Karl says there’s more to do. Patty is optimistic, but has conflicted feelings. It’s a big step, but if Bill needs help they’ll be just up the street. Karl and Bill Rabe are serious amateur magicians. Here's one of their routines.